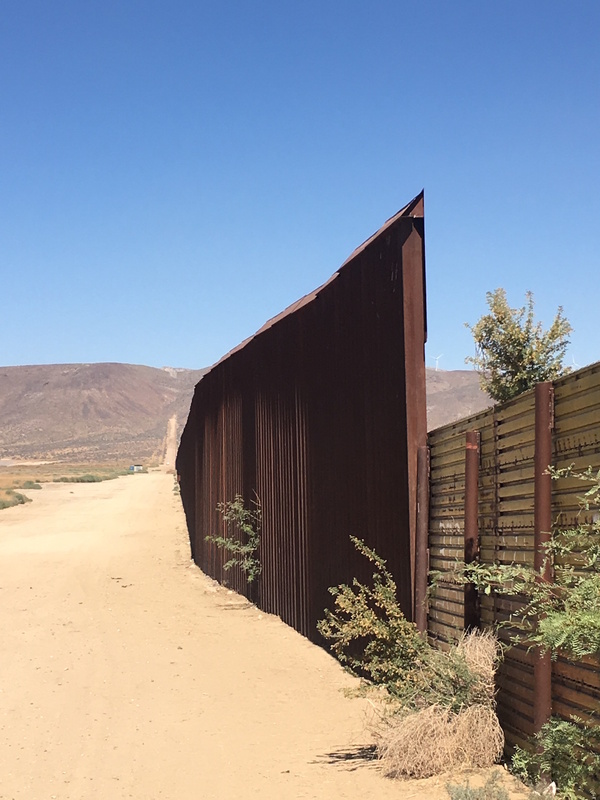 The beginnings of a wall with Trump’s name on it have emerged along the US-Mexico border, but it is not likely what the presumptive Republican nominee has in mind. 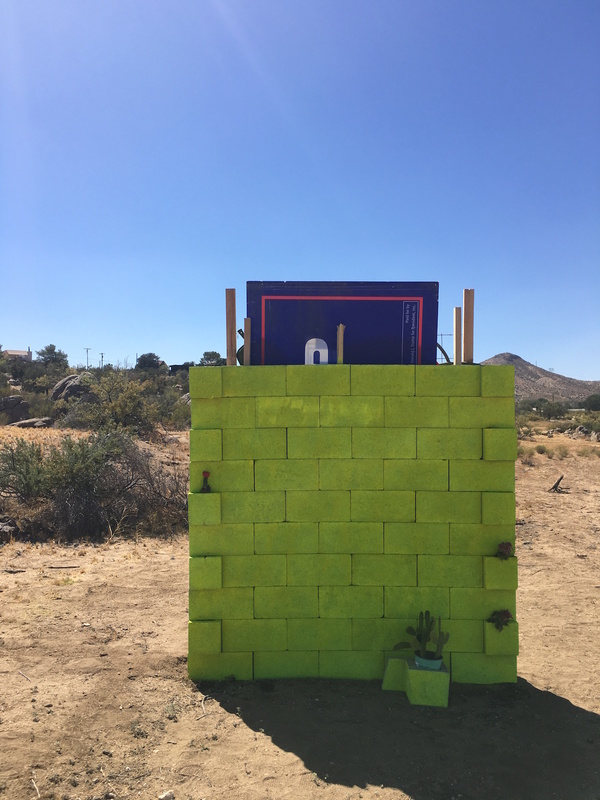 Last week, art collective t. Rutt erected the 52-cinder block structure near Jacumba Hot Springs, California, a mere 20 yards away from an official, looming border fence, to contemplate the economic effects of restricting immigration from Mexico. If the collective’s name sounds familiar, you may remember them as David Gleeson and Mary Mihelic, the pair who transformed a former Trump campaign bus into a mobile protest work that they’ve been driving around the country since last year. 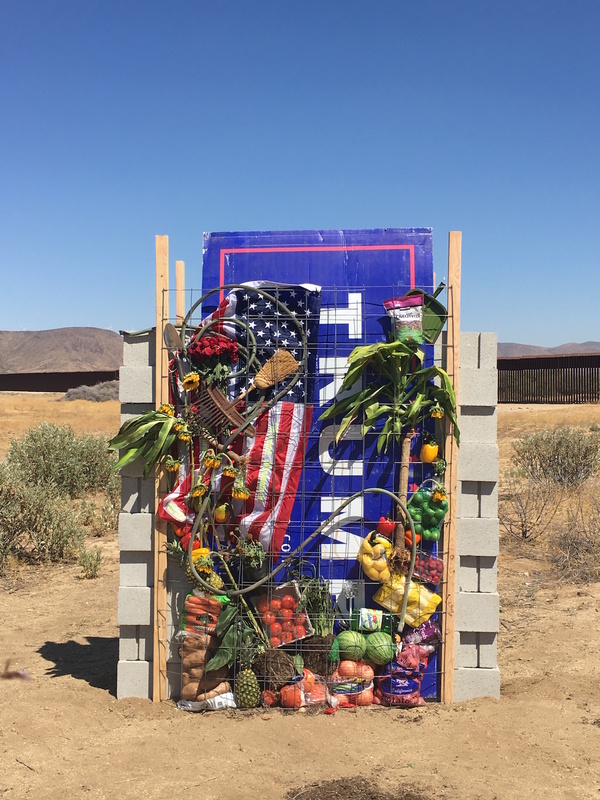 This latest, static piece features a curious collage, marrying a Trump campaign sign with an assortment of fruits and vegetables, among other seemingly random objects. 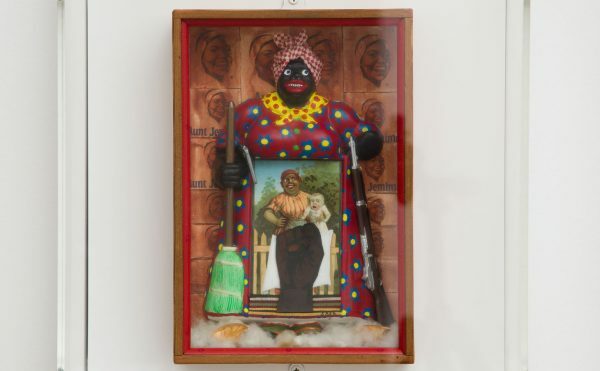 It is, as the artists told Hyperallergic, “about what would happen to the US if all the immigrants were stopped at the border and Trump truly deported 11 million people back to Mexico. 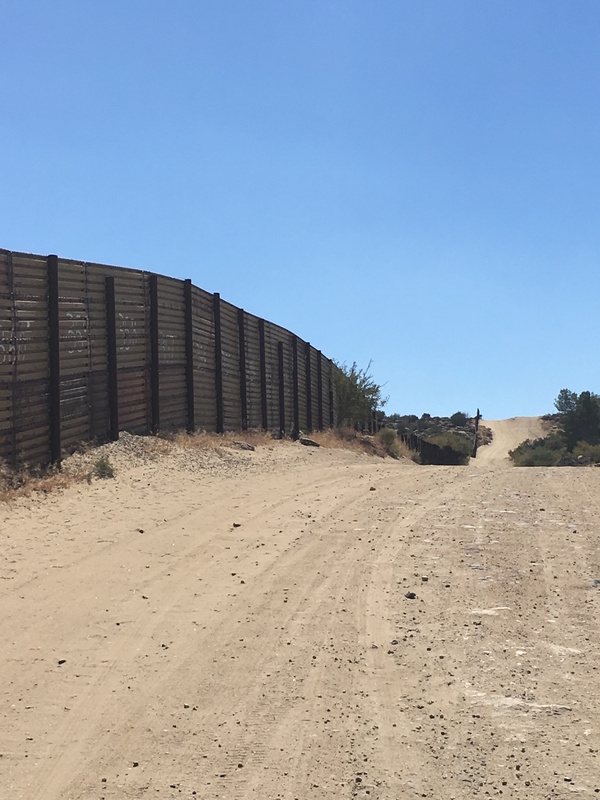 Contrasting with this heavily adorned surface is the Mexican side of the wall, which simply presents the naked surface of blocks painted fluorescent yellow — the color of road warning signs — accompanied by a scattering of cacti. 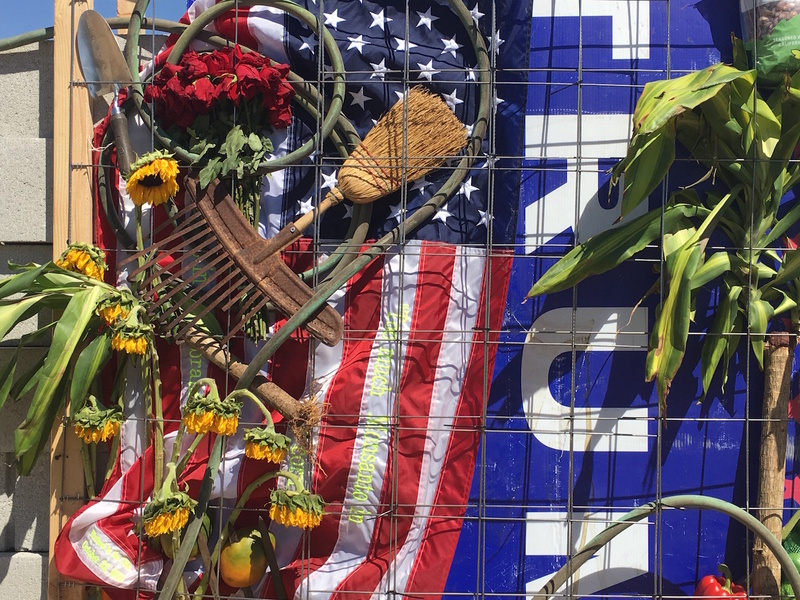 “That color symbolizes everything from ‘don’t get run over by what’s coming down the road’ to peaceful protest — ‘please come over and engage with us about Trump,'” the artists said, adding that the cinderblocks hint at the interiors of detention centers. And in a gesture that highlights the absurdity of Trump’s demand that the Mexican president pay for the wall he envisions, t. Rutt has mailed Enrique Peña Nieto an invoice for this portion of the wall — construction of which amounts to $14,635.42. 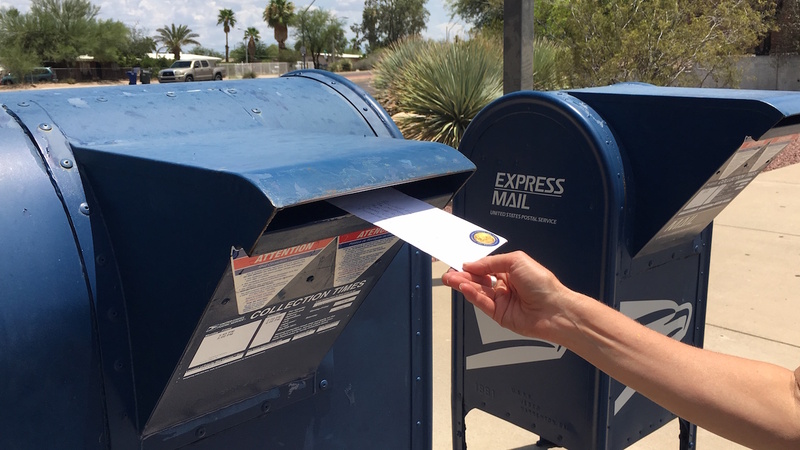 “On behalf of the good citizens of the United States, we submit this invoice for prompt payment for work completed to date on the Trump wall,” reads the document, which tallies the cost of everything from material to the annual US land usage fee per square foot to maintenance fees. 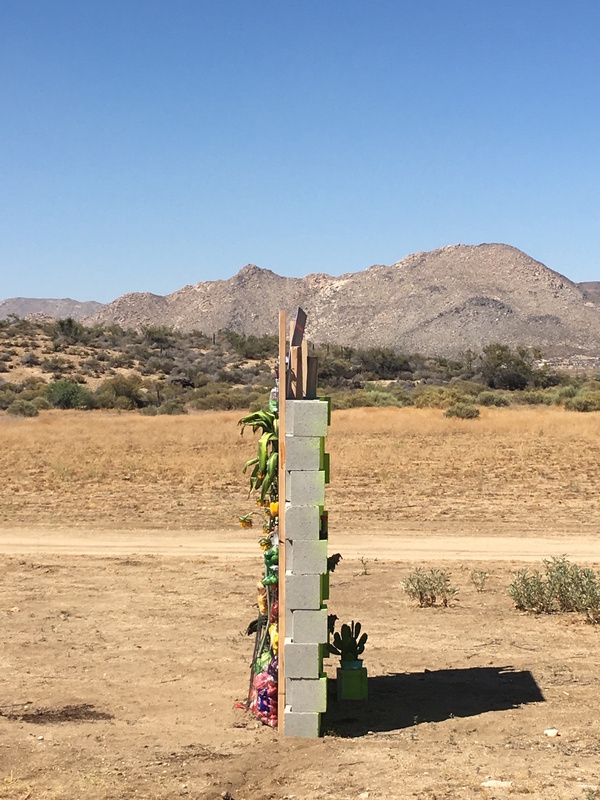 Unlike most site-specific Trump protest art, which tends to be short-lived — see the Central Park Trump tombstone or Plastic Jesus’ “No Trump” street signs — this one is likely here to remain indefinitely by the border. 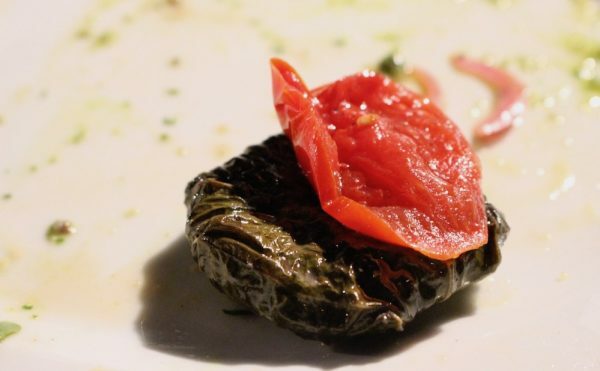 The spot was what t.Rutt describes as “a gift” from the landowner, David Landman, who actually holds over 200 acres of the desert town (including a nudist resort that he personally frequents). 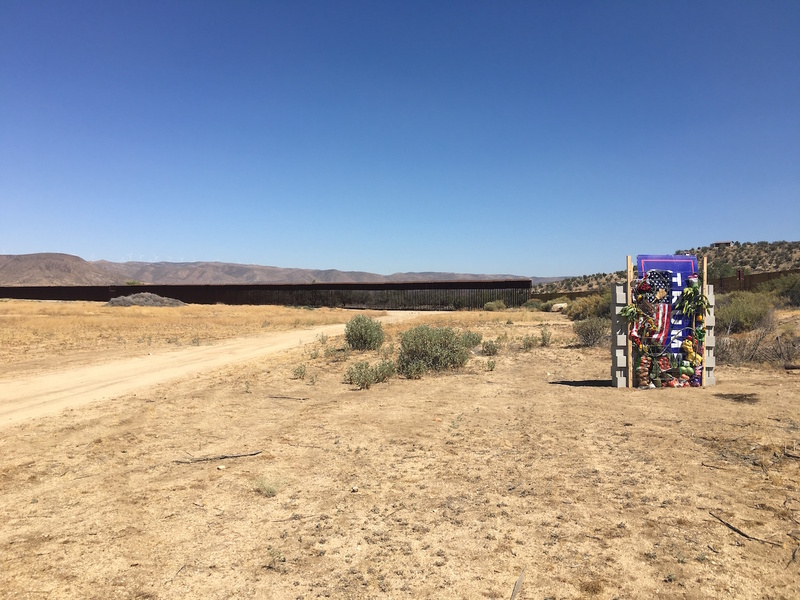 The couple came across the location while on the road in their bus and called up Landman, who granted them permission to erect the wall and said he plans on leaving it up “forever” — despite the fact, according to the New York Times, he is a registered Republican who will likely vote for Trump. 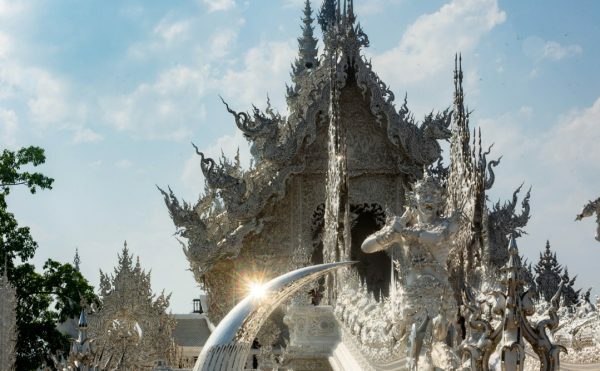 Gleeson and Mihelic envision the wall as an open-to-all collaboration, hoping that other artists will visit it and add their own creations so it stands as an ever-shifting artwork. So know that while public parks and streets are essentially off-limits to your reactions of frustration at this election, there is one very visible plot of real estate in the outskirts of California that will welcome your micropenis drawings, menstrala portraits, and other creative antics.